RiskAnalytics’ primary goal is to protect our customers. We believe that blocking, detection and visibility are key to that mission. This week, we made improvements to the ShadowNet Customer API and the RAForce portal to provide more response capabilities to your IT staff. 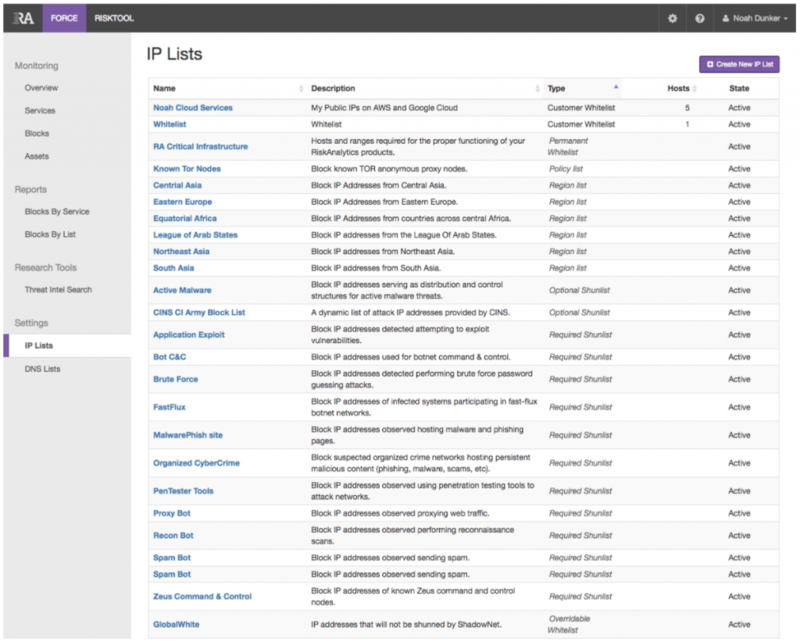 Our default IP Lists protect you from Reconnaissance scanners, Brute Force, Application Exploits, Malware, Phishing sites and other threats that we’ve directly observed with ThreatSweep on live, production networks. Access is also provided to a number of optional frequently-updated feeds to block geographic regions, TOR and anonymous proxies by IP address. 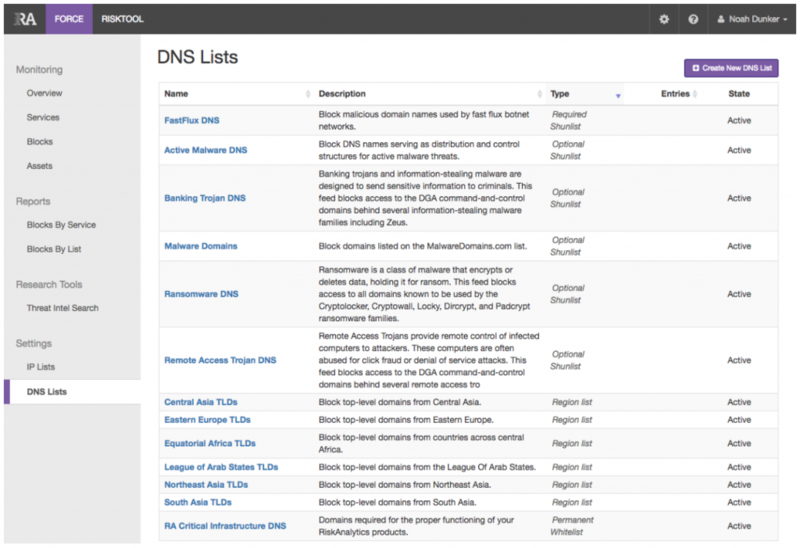 Our DNS Feeds include RiskAnalytics’ own MalwareDomains.com list, our highly-targeted ActiveMalware and FastFlux DNS feeds and optional lists to protect your endpoints from Ransomware, Remote Access and Banking Trojans that use frequently-changing domain names. Regional TLDs should be used with caution in a DNS filtering environment, but they are available via the API if desired. Contact sales@riskanalytics.com to get access to these new features, with a 14-day money-back guarantee. The most noticeable change for existing RiskAnalytics customers is the introduction of the Assets monitoring panel in RAForce. This asset-centric panel displays source addresses for outbound blocks. With the addition of this panel, the IntelliShun can now report on internal IP addresses for outbound blocks when it is deployed on the trusted (LAN) side of the firewall. 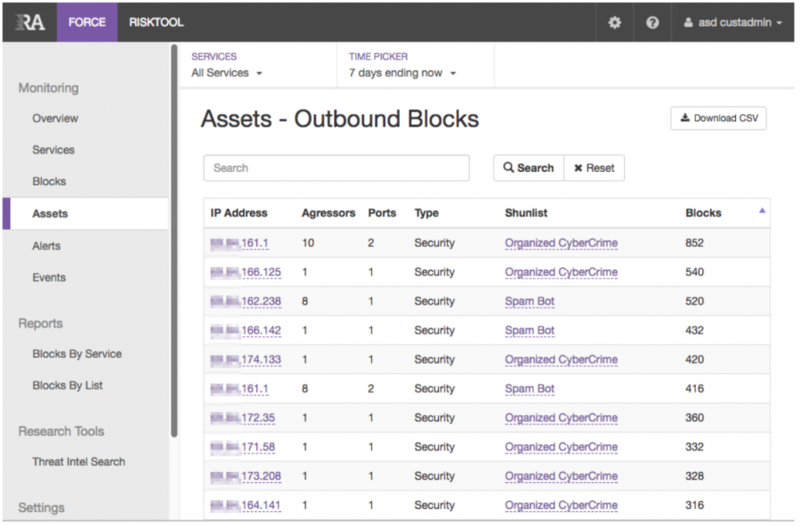 The ability to highlight assets on your network that may require your attention is a significant change to how IntelliShun can be used to help secure your network. You can read more about the RAForce Assets Panel and IntelliShun1G Network Placement via our Solutions Portal.